... it's been far too long since I last wrote an entry here. It's been a busy few weeks with one or two things in my personal life taking up a lot of time, and then a holiday in France a couple of weeks ago. Holidays from the shop are always lovely, but then again it takes me weeks to catch up when I get home! The holiday was super. I adore France - one of the reasons I love to sell French toys. I went with my boyfriend Mike and his daughter, Isobel. We spent most of the time in the South, near the Spanish border, then a few days driving up through France staying in little b&bs I found on the wonderful Alastair Sawday website. My mother was a complete star while I was away, running the high street shop and packing up all the mail orders which I continued to manage from France. All in all it went quite smoothly. On the subject of France, a lot of places close down during August over there, and Moulin Roty - one of our main toy suppliers - is one of them. As such I'm afraid we're very low on stock at Cottontails while I wait for them to catch up and start sending orders again. 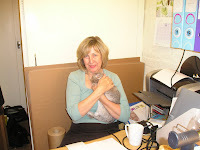 Here is a picture of my mother holding the fort in the stock room... Humphrey is helping out too! Captain Rupert (my rabbit) and I have been delighted to discover your blog while looking for toy referance for a new painting. I do hope all your bunnies feature more on your blog I'm sure they are great helpers and love seeing all the new rabbit softies arrive. It is lovely surprise to find a blog full of rabbits, which are my great passion and our new found interest toys and baby things (reason to remain secret for now!!). Captain Rupert would like to add your blog to his rabbit friends list on our blog. It might take a little while, I too have not been too good at blogging recently,but we are finding our way back. I too have been enjoying looking at toy shop windows in France too, and have just come back from south France near the spanish border.